This past weekend I was in Knoxville for my brother's college graduation. Whenever I'm home, I try to make my rounds to a lot of stores and places we don't have up here in DC. Like more affordable apartment stores. Belk is one of my favorites. They generally have a great selection of brands that you can't find anywhere else. One such brand is Crown & Ivy. When my mother and I walked into the store, I went crazy. They had so many colorful, vibrant pieces for summer. I wanted it all. While I ultimately decided my budget wouldn't allow such a shopping spree, I narrowed it down to four pieces. 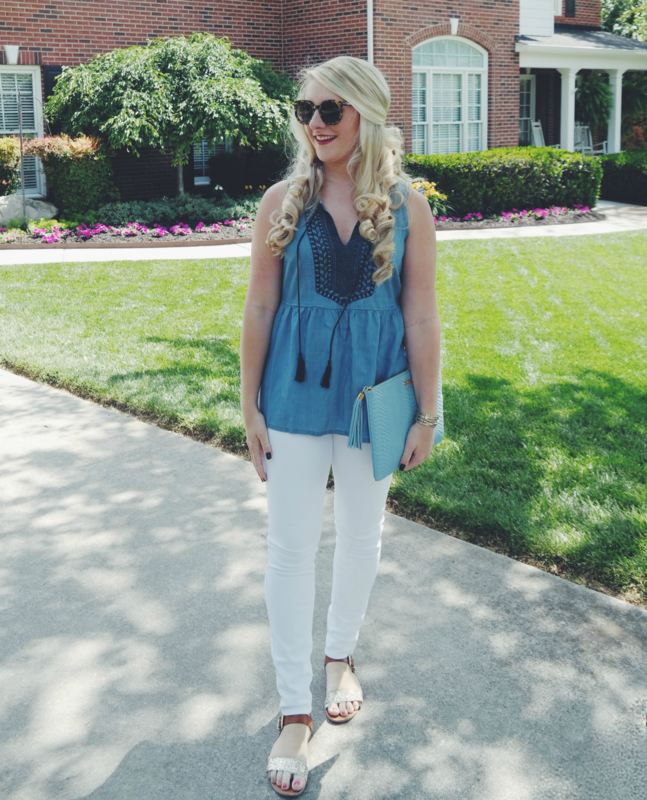 I got the top featured in today's post, this top, this top and this gorgeous open back number for the beach. I'm obsessed. Now let's talk about this top. 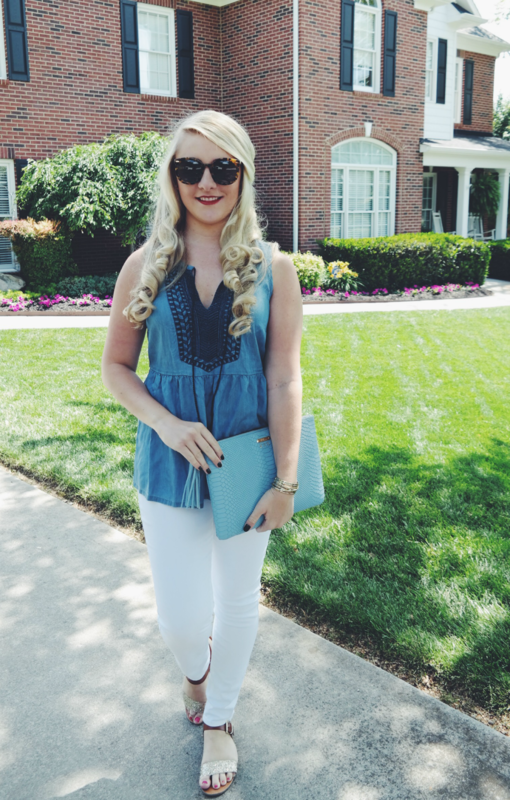 I love wearing chambray in the summer. Especially sleeveless tops like this. The fabric is so lightweight and comfortable. I'm obsessed with the details on this piece. From the design, to the tassels. It's summer perfection. 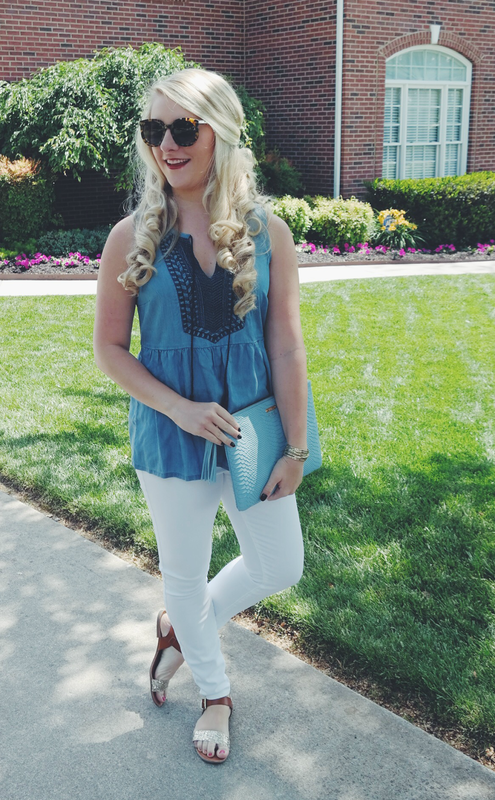 I paired it with my new favorite white skinnies, and my gorgeous baby blue clutch. It was the perfect outfit for an evening out with family. I love that top! 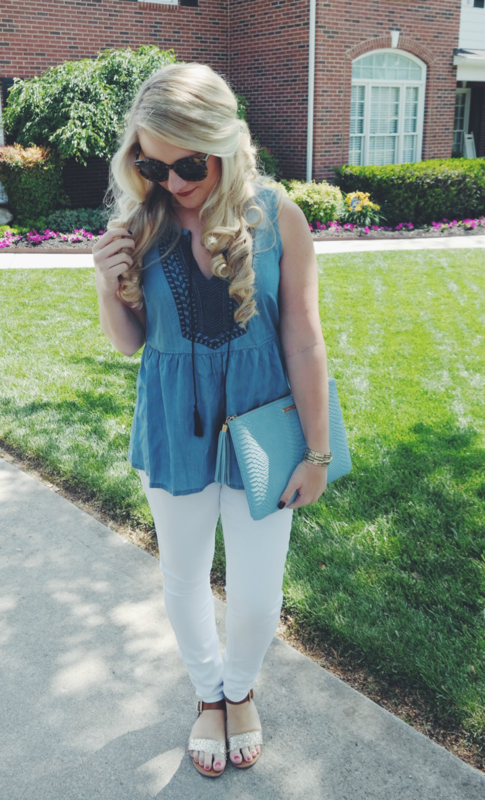 It looks super flattering, and I love the embroidered detailing. Thanks for sharing a new brand! I will definitely have to check out this collection at Belk! I'm from up North and am pretty loyal to Macy's, but every time I walk through Belk I love everything! Great Summer look hun! Thanks Ellen!! Happy to introduce you to a new brand! You definitely should Courtney!! I love Macy's too, but Belk is a great Southern store as well :) Have a great weekend!! I love your shoes! Perfect for Summer! 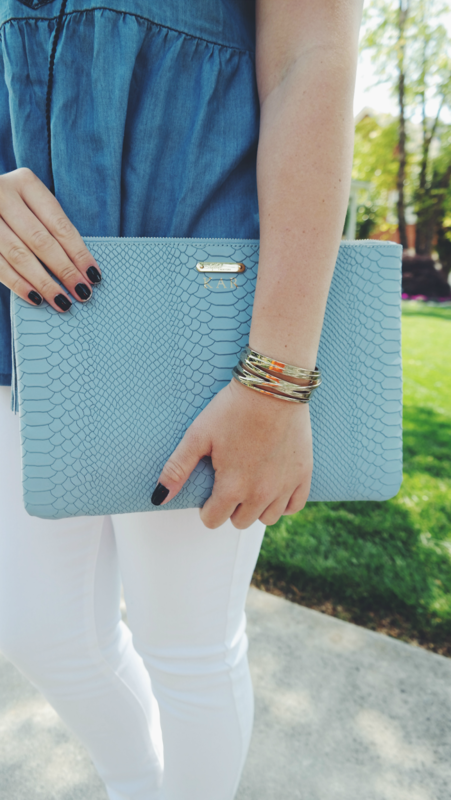 I ADORE the color of that clutch! It's so bright and summery. Gigi makes the best clutches, such high quality. What a lovely look. Love that shirt. Thanks Rachel!! I seriously haven't stopped wearing it, ha!